Either you love 'um, or you don't. If you love 'um you've got to try this. Beets are loaded with fiber, manganese, folate, potassium, magnesium, and iron, along with other antioxidants found only in beets (betalains). I've grilled them, roasted them, and made a salsa from them, but this bisque is easily my favorite use for them. Preheat oven to 400 degrees. Lay beet cubes onto a baking sheet lined with parchment paper. Spray cubes with olive oil spray, then sprinkle with dashes of salt and pepper. Place baking sheet into the oven and roast for 30 minutes, or until a fork can easily puncture a cube. 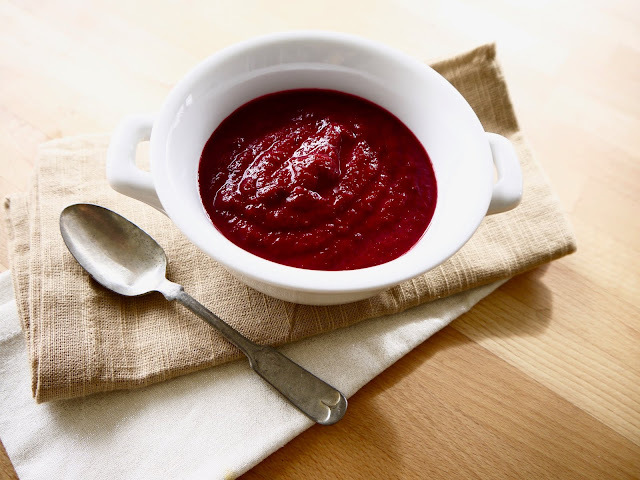 When beets are done, melt butter in a soup pot over medium-high heat. Add onion and saute until onion is lightly brown and softened, 5-6 minutes. Pour in broth and add beets. Bring mixture to a boil, then reduce heat to a simmer and cook for ~10 minutes. Use an immersion blender to puree the mixture (make sure that you keep the blade in the mixture or you will end up with some slightly intensive cleaning on your hands). Add additional salt and ground black pepper, to taste. Serve immediately!